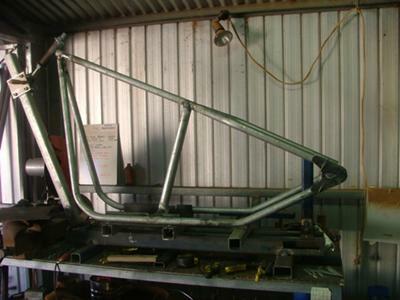 Bobber Frame: This is my shovel chassis I started building, and I also made my jig rake, but it's not set yet. Tips On Starting Your Frame Build! Get some jig plans and chassis plans, bender plans, and tube notcher plans. Print them on A3 paper. This will enlarge it enough to read convert the inches if you like to mm on your mobile phone tool. Make your jig as versatile as possible and you will add bits and pieces to your jig as you go or wish. There are many plans for different chassis. I chose the most basic and that's good for me, but this will be my prototype used for a quick reference of dimensions and mount measurements for future builds. I'm also going to build a trike servicar direct chain drive to an old differential. Take note it will not be cheaper, but you will be able to spend at your own pace. It's the experience thing for me not the money issue and I have good resources as I work in the engineering, mining sector, so materials are not an issue. Find old tube or pipe to practice on and get to know your bender it may take a few bends. Practice all your welding etc. on old stuff from the local dump. Notching tube, if you're good with a grinder and use a flap disk you can notch like I've done without a miter plan or notcher. You can find tube miter tool on the google search tool. Any problems I'll help you where I can. Remember most mistakes can be rectified so don't chuck the tube across the shed and hit the beer fridge. This is just the time to put every thing down and think of an idea to fix it, there will be more than one way. That will come down to resources, ability, patience, and you preference of approach. You will learn more about your limits and you patience. You will increase your skills in metal work and learn a lot along the way. It's for this reason alone that building your own from the ground up worth it. It's much more than just a bike. It's definitely an experience no rider should over look if that is their ambition. There are links to other useful sites. You will be using a few sites including this one of course. So no more TV for a while. It'll be flat out research. I sometimes even have been known to take my laptop in the shed to check something rather than print and have paper flying every where. Join in and write your own page! It's easy to do. How? Simply click here to return to Your Bike.